On the 12th of March 2019, a meeting with newly appointed Ambassador Extraordinary and Plenipotentiary of Spain to Turkmenistan (with residence in Moscow) Mr. Fernando Valderrama Pareja was held in the Ministry of Foreign Affairs of Turkmenistan. At the beginning of the meeting, Ambassador presented the copies of his credentials and expressed gratitude to the Turkmen side for the hospitality as well as for organizing this visit on high level. He has also stressed the vital role of Turkmenistan in providing peace and economic development in the region and underlined that being a visual example of a neutral state, Turkmenistan makes a valuable input in the process of promoting peace and stability on the Earth. During the meeting, the parties stated adherence of the two countries to intensifying relations between Turkmenistan and Spain both in bilateral format as well as on the level of international organizations including the European Union and the United Nations. The presence of vast potential for developing cooperation in the political, trade-economic and humanitarian spheres was stressed. The parties underlined that it is necessary to activate bilateral visits on different levels for widening the bilateral ties. The proposals to hold next political consultations between the Ministries of Foreign Affairs this year were expressed. The parties also thoroughly discussed the opportunities for developing cooperation between the business circles of the two countries. 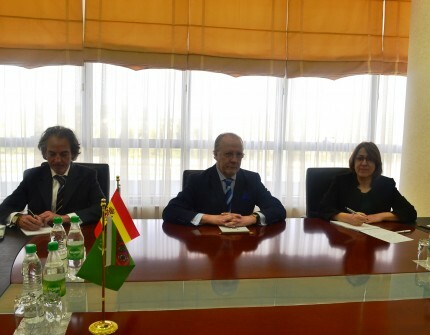 The Ambassador especially noted that during his present visit he is accompanied by the representatives of a number of Spanish companies which express hope for broadening activities in Turkmenistan. As to the humanitarian cooperation, the parties stressed the significant role of establishing the projects in the area of education, including the programs on teaching Spanish language in Turkmenistan. At the end, Ambassador of Spain expressed his hope for further cooperation and his readiness to work tirelessly on strengthening Turkmen-Spanish relations.